Giving your interior decor a truly professional look requires a little more than a strategically placed vase or the perfect window treatments. It takes cutting-edge highlights - the kind of highlights that only LED lights can provide. When the right LEDs are properly installed, they�ll transform your space from ordinary to extraordinary. Your kitchen is arguably the most important room in your home. How it looks can make or break a sale, create a warm and welcoming feel, or give a cold impression that sends people running for the living room. And that old saying is as true for homes as it is for people: You will never get a second chance to make a good first impression. What yours does is largely a result of the way you accent its features. Here�s where toe kick lighting in kitchen spots strategically selected can really help. Traditionally, designers have limited LED use to outlining coves and backlighting crown molding, but home styles are quickly evolving. Most design experts agree that LEDs located in the toe kicks around islands and cabinets can bring out the best in your kitchen. Combine them with a few under-cabinet LED lighting ideas and you will be amazed at the difference. Toe kick lights are a smart and cost-effective way to give your kitchen a modern makeover. LED lights are a far cry from incandescent bulbs. LEDs offer more options than were ever possible with traditional lights, but knowing how to pick the right combination for your space is essential. 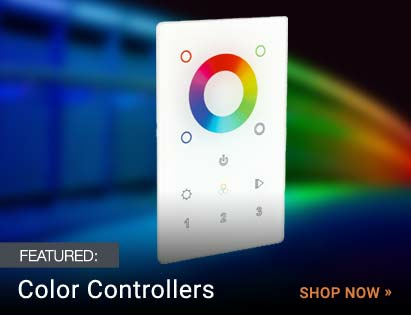 You�ll have to consider shape, color temperature and brightness. Shape: Because toe kicks force you to install your LEDs in a very confined space with extremely precise measurements, it�s best to choose a directional rope light or an LED tape light. Lights like these feature just the right amount of spacing - you never want more than 2 inches between bulbs when you�re illuminating a toe kick - and they�ll fit nicely in the joint of your island or kitchen cabinets. Color temperature: Think of LED lights on a spectrum. At one end, there�s cool, crisp light; the kind that sunlight glinting off fresh snow produces. At the other end, there�s the warm glow of a fireplace in a dimly lit room. Color temperature is measured on the Kelvin scale. 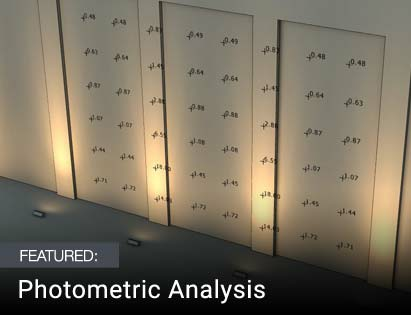 Cool lights have high Kelvin measurements, and warm ones are much lower. You can expect to find a bluish-white light from LED lights marked in the 5,000K to 6,500K range, while more yellow tones result from lights in the 2,700K to 3,000K range. For most kitchen islands and cabinets, it�s best to land somewhere in the middle. White and neutral lights are generally marked between 3,500K and 4,100K. 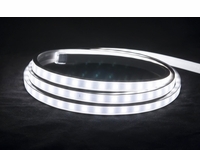 When LED rope lights and standard low voltage LED tape lights won�t work in your space, whether because they�re not bright enough (rope lights) or because they�re too difficult to hide the required drivers (low voltage tape lights), you�ll likely have better luck with LED tape-rope hybrids. These combination lights take the bright LEDs often found in tape lights and combine them with the ease-of-installation and 120 volt line voltage that rope lights provide. Installing LED lights is incredibly easy. It just takes a little time and preparation. 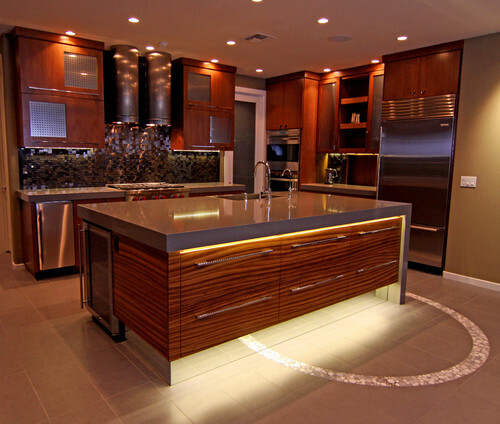 Before you know it, you�ll be flipping your kitchen lights on and off, enjoying the soft, ambient glow they create. Remember that you�ll need a power source, so if you don�t have one installed inside one of your end cupboards or your island, that takes priority over everything else. 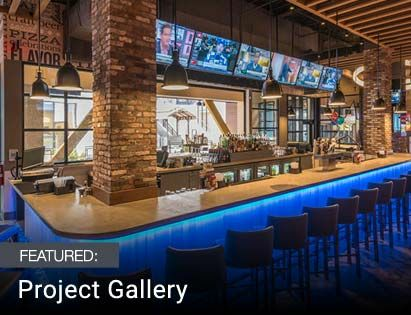 If you have a power source and you�ve already purchased the perfect LEDs, you�re ready to dive into the DIY LED installation process. 1. Measure the entire perimeter of your kitchen island or the length of your cabinets from end to end. You�ll need to build in a little wiggle room for your power source and for interruptions in the kickplate, such as dishwashers, ovens or trash compactors that don�t have an overhang. 2. 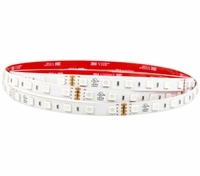 Start affixing the brackets for your LED lights by following the manufacturer�s instructions. If you�re using individual mounting clips, we recommend you don�t allow more than 6 inches of space between clips; if something happens to one of them, your lights could droop or sag, causing uneven lighting and a sloppy appearance. Another option is to use a mounting track which will hold your rope lights or tape-rope hybrids in a nice, straight line. If you�re using tape light, you can skip this step because you will use the adhesive backing on the strip. 3. Stretch out your rope light or tape lights on the floor, directly in front of where you�ll be installing them. This serves two purposes: one, it�s a built-in double-check to make sure you have the right length; and two, it�s easier to install the lights when they�re already almost in position. Starting at the end with the power source, snap your lights into the clips or mounting track. If you�re using tape lights, start at the same end, but peel off only 6 inches of backing at a time. That way, if you drop your strand or if you accidentally affix the light in the wrong spot, you won�t be too far off-course. The lights should be installed right at the joint of your kickplate and the bottom overhang on your island or cupboards. 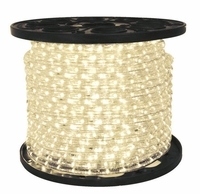 This gives you the widest range of light and helps keep the rope or tape out of sight. Because LED lighting in your kitchen can help boost your home�s value, aesthetics and welcoming appearance, it�s a good idea to check your lights periodically to make sure they�re still affixed properly. While there�s no guarantee you won�t run into slip-ups during the process, you�ll definitely love the finished product. 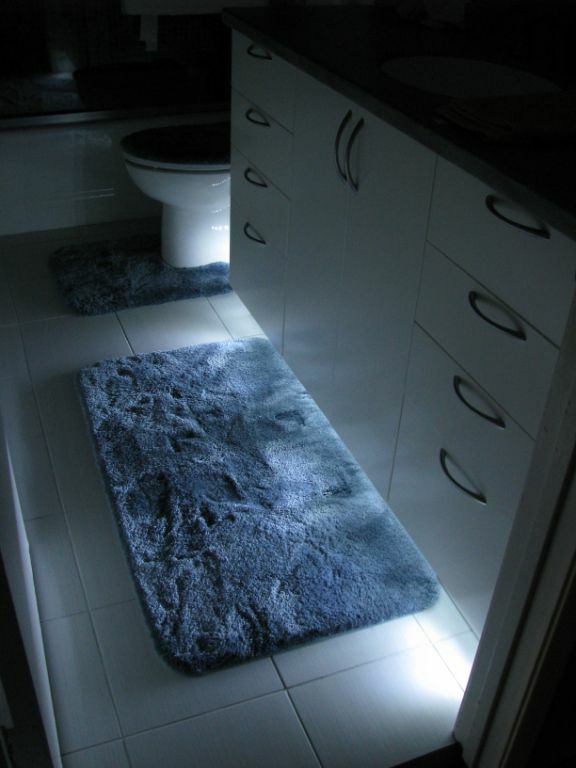 Toe kick lighting also works great as an attractive night light in bathrooms!